Just love the patronising tone…Still, it’s nice to see and is going to be good to observe. No more hiding from the facts. Perhaps the Royal Society should send their newest fellow, Prince Andrew. According to the methodology used in Cook et al. (2013), Prince Andrew was elected to the RS with a consensus of 100%. I am interested to know why you think this is patronising. The scientists batting for the GWPF include Richard Lindzen and on the economics side is Richard Tol. Both are highly successful in their fields and have published many papers, and both have contributed to IPCC reports. Do you imagine that the “deniers” are some fruitcakes that crawl out of Alex Jones’ office? Dr. Roy Spencer threw down his “put up or shut up” challenge (May 10, 2013) to Principia Scientific International (PSI) demanding PSI prove they possessed a better climate model than the discredited greenhouse gas “theory.” PSI’s model accounts for all the incoming and outgoing solar energy on Earth without any need to factor in the alleged heating effect of carbon dioxide (CO2). As such, PSI promptly did “put up” and now Roy has been shut up. Isn’t David siding with GWPF? I thought he meant RS was patronizing GWPF and there was no more hiding from the facts for RS. I know, when I first saw that site I thought it was a spoof. Smells awfully like Gore’s Reality Drop project to me. Wrong David. I was referring to the Royal Societies attitude. Ah, I thought there were 2. Might be good for one of you to be David 1 or 2, or even better, use an initial too (unless they’re the same of course, mine are RSC and I still get confused with Richard S Courtney even when I use my surname which isn’t “Courtney” – hence the “(NZ)” to distance myself from Courtney in UK). On the question of two Davids: I’ve seen no sign that there are two of them. This David and the one who is a fan of The Crusaders and Triumph motorbikes? Ah, the other thread. Yes, they’re different. Listen up, guys: When names are duplicated, the second must be accompanied by another letter/s or word/s, because having identical personas is silly. If not, comments from both personas will be blocked. Easy for me. Thanks. Yes I do remember you David and your penchant for stirring up poor old Ken. New David is the imposter! RT- I have commented before and over several years. I do enjoy stirring Ken up as you may remember. The “new” one who has been challenging you should change his name as I was here first. Check the IP addresses if you want. I’m sure you’re right, then the other David is the one who has to change. Let’s see if he’s convinced. Sure RT, I originally commented here as (not so) silent also. Perhaps you should require people to register before they comment. They do on blogs like Kiwiblog and it just cuts all this confusion out. Increasing concentration however, doesn’t have the effect of increasing forcing beyond an initial threshold in combustion engineering curves at the 273K end but no-one knows exactly what the effect is in the atmosphere (the IPCC doesn’t know – they haven’t verified their assumption/simplification of a straight line on a log-log graph and they assume that one line/curve is applicable for the entire temperature range of the atmosphere). But in extreme cases the effect is to a very large degree (a curve for 2730K is different than a curve for 273K from what I can gather but I can’t link to anything on the internet – it’s in books). NASA describes the thermosphere as being “lit up like a Christmas tree” and “It began to glow intensely at infrared wavelengths as the thermostat effect kicked in” when, “for the three day period, March 8th through 10th, the thermosphere absorbed 26 billion kWh of energy. Infrared radiation from CO2 and NO, the two most efficient coolants in the thermosphere, re-radiated 95% of that total back into space”. I cannot see how absorbing 95% of 26 billion kWh of energy can be described as contributing “no warming whatsoever”. That warming doesn’t hang around for long though, as the warmists would have us believe. I think that is the crucial distinction that should be made when the word “warming” is used. I’m not too anxious about the confusion. People identify themselves and their opinions because they want to be identified correctly, I don’t need to help them. Nor do I want to be a government, telling you all what to do. You can all sort it out, I’m sure. That’s a different email address from our “other” David, so it might be a third David. Wow! Discussion of the multiple identities of “David” takes precedence over flat-earth, no-day/night GHE model vs round-earth, day-night no-GHE model (gets snipped in favour of far more important issues of inanity) in this comment thread. Hopefully the pressing issue of the respective identities of “David” will be resolved soon. I can see how that would relegate one of the more bothersome GW/CC issues to 7 line single comment space to make way for 15+ more important comments on who “David” might be. BTW, I very much doubt the RS and GWPF will even raise the GHE issue, both will take GHE as gospel unless I’m mistaken. It’s not taking precedence at all. Just don’t pile screeds of other people’s writing in here. Summarise, rewrite and post again. It’s great stuff, but not related to anything except in your own study. Think of other people! No, don’t remeber you at all, David. Cant have been any significant comments from you. RC, the interpretation of the Solar storm high atmosphere heating is this: The energy from the solar storms arrives not in form of light but in form of high speed particles. These lose the energy through collisions in the highest layers of the atmosphere. The most efficient IR active molecules in the high atmosphere are NO but in particular CO2, which due to its trimer composition and associated vibrational modes is an efficient IR absorber and emitter. There is of cause no H2O in these altitudes. Energy loss of the high atmosphere is primarily by IR radiation and indeed CO2 is carrying the main load of that. This is why the addition of CO2 to the Atmosphere has already had a cooling effect to the temperature of the Mesosphere. This is quite dramatic actually, is well understood and unfortunately is been misquoted as a ‘proof’ that CO2 is cooling the atmosphere as such or as a means of ‘debunking’ the green house effect by some hobby scientists…. Whilst these links to basic radiative physics may be fascinating, I would point out the sidebar link to Science of Doom which covers most of this. Thank you Thomas. In other words a very efficient energy transfer medium, by definition a coolant, refrigerant code R744. Indeed Andy, the Backradiation Chapter on the Science of Doom” site is not bad and anybody who doubts the influence of CO2 on the energy budget of the planet would be well advised to read whats written there. It seems that some people still do no understand the basic radiation physics involved and cry ‘hurray’ when they discover that as part of all this the upper atmosphere must cool and break out into a joyous chorus that now for sure the whole AGW theory must fall, that CO2 is a ‘cooling agent’ or that ‘CO2 is a heat shield and cools the planet’ or whatever variation of the theme that is peddled….. All seen before in many places. Hi Richard C, Richard T has linked in the side panel here to the right, this website called Science of Doom. Andy also recommends it and its not bad. Here is the chapter on back radiation. Worth a study. And CO2 (compressed and then released) is a great coolant. I used to make dry ice with a fire extinguisher (CO2) for students. Always impresses. But that has nothing to do with radiation physics but simple gas law stuff… of cause you know that. Indeed CO2 assists a hot atmosphere to emit radiation from its top. But it hinders the passing of radiation from the bottom through it. The later effect causes the bottom of the atmosphere to heat while the top cools. Precisely as measurements prove it to be. A bit like double glazing perhaps. As compared to single glazing the outer window pane is cooler than before (with single glazing) but the inner pane towards the room is a lot warmer. Exactly what would be expected due to the higher ‘resistance’ to heat transmission of the window. Precisely as measurements prove it to be. Uh, no. The atmosphere isn’t heating up according to the AGW theory. Sorry. First of all, it is predicted to warm at over 0.2°C/decade, and accelerate. Isn’t happening, we’ve flat-lined for almost two decades. Second, the tropical upper troposphere is expected to warm at two to three times the rate at the surface, due to positive water vapour feedback. Isn’t happening at all. Nada, zip. which is on the effect you commented about. You may find a lot of your questions well discussed there and the relevance towards AGW put into perspective. This post by Richard T is aptly entitled “Barriers coming down” and in my experience in participating in discussions on AGW for a long time now is the fact that many people have barricaded themselves into a dogma and will not actually read let alone spend time to understand the science as it is presented. All to often arguments brought against what science presents us with are pronounced by people who neither read nor understand nor want to read the science but have a’prioi opinions that they do not want to see challenged. I hope in the spirit of “barriers coming down” this can change. Yes, we’ve been referred to that page ad nauseam. Cook the Cartoonist is trying to pretend that the “fingerprint” of GHG is in fact the stratospheric cooling, not the tropospheric warming. He’s trying to pretend that the big red spot in the middle of the diagram isn’t really there after all. The simple fact is that stratospheric cooling can be caused by CO2 and ozone. Is there more CO2 up there? Yes. Big deal. The whole point about the hot spot is that it is a necessary outcome of water vapour feedback. As CO2 increases the temperature, it causes a water vapour increase in the atmosphere over the tropics and more GHG warming. Simple. So no hot spot implies water vapour feedback is zero. Which implies CS is as low as the sceptics have been saying for years. Doubling of CO2 concentration will produce at most 1.2°C increase. Face it, the science is telling us the sceptics have been right all along, and the alarmists were wrong – we aren’t all going to fry. Uh… why not use your whole name guys? >”Hi Richard C, Richard T has linked in the side panel here to the right, this website called Science of Doom. Andy also recommends it and its not bad. Thanks anyway, read all that a few years ago. But here’s an idea for you Thomas. Why don’t you access the DLR databases that SoD links to for his examples of DLR graphs e.g. Darwin. Try to find any evidence at all that DLR has been rising anywhere in the world at any location where observations have been made for many years now that is commensurate in sign and magnitude with CO2 forcing? Good luck with that Thomas. Or, but preferably in addition to the above, you could present some observational peer-reviewed scientific literature. I suggest Gero and Turner (Great Plains USA), Francis and Hunter (Arctic/Barrow area), Wild et al (GEWEX network), Wu et al (I think they are – SURFRAD network), and a long-term Antarctic study for which I can’t recall the authors off-hand. Just checked Thomas. I have 13 pages of Science of Doom bookmarked under ‘Climate Science’ – ‘Heat and Ocean’ for ready reference. They’ve been there since 2010ish. ‘AGW Busted’ sub-folder has 138 pages. ‘Models’ sub-folder has 11 sub-sub-folders, here’s 5 of them: ‘Codes’ has 17 pages, ‘NCAR’ has 29 pages, ‘NASA’ has 2 sub-sub-sub-folders – ‘GISS’ and ‘GSFC’, GISS has 17 pages. ‘Models Articles’ sub-folder has 179 pages. ‘WCRP’ sub-folder has 18 pages including the RCP Database. ‘Water Vapour’ sub-folder has 67 articles. Please remember this Thomas, before you point us/me to some web page. It might help if you had a sub-folder called “Fact” and another called “Fiction” but I suspect that you would have trouble working out what link went where and that there might be very little in Fact. Speaking of preaching, I see the religious fundamentalists are back at Hot Topic preaching about custodianship and social justice and badgering the Churches to adopt their religion. And apparently, going by that graph, my ‘Climate Science’ folder should be divided into the sub-categories of ‘Fact’ and ‘Fiction’ – thanks for that suggestion Simon – so that I will have a new ‘Climate Science’ – ‘Fiction’ – ‘Models’ path. I will have to be careful though, not to move the ‘Non-IPCC Natural Forcings’ folder (8 pages) – i.e. the models that are actually on track with observational fact – into the ‘Fiction’ folder too. That should really stay somewhere in “Fact’ shouldn’t it? That’s a start isn’t it Simon? BTW, ‘Non-IPCC Natural Forcings’ folder (8 pages), looks like it will be a bit tiny in ‘Fact’ given the bulk of ‘Models’ (the IPCC-aligned CO2-forced configurations) gets moved to ‘Fiction’. Episcopal Green is a long way down that track Andy. Thomas, I see SoD’s post of Darwin DLR has “The mean = 409 W/m²” per day. Instead, their attention is on DSR and the figures (10.12 onwards starting at page 268/8) show daily solar radiation of around 20 Megajoules/m² per day at Darwin. That works out, by my reckoning, at about 230 W/m² per day. Shouldn’t you be advising the Australian Govt that there’s a major un-tapped energy source around Darwin that they’ve overlooked? Brilliant response RT. Totally agree. Question: Why do commenters use a pseudonym? I’m not telling you why I use a pseudonym. Is there a way to switch on avatars (pictures) for users? It is a wordpress blog I presume. 3) Looking at the two statements you and suggest we should use DLR as an energy source…..
A) When considering DLR as an energy source you must also look at the emission of IR from the ground! Darwin, hot as it is, might have an average annual temperature of say 28 Deg C. (I am guessing here based on worldweatheronline). At that temperature the average ground radiation upwards will be about 465W/m2. B) Therefore the NET radiative balance of energy leaving the ground via radiation is about 60W/m2 = Outgoing at 465W/m2 minus DLR at 409W/m2, rounded to 60W/m2. As this is NET energy leaving the ground, you won’t be able to utilize this as a power source at the ground. You can only use thermal radiation as a power source via some heating process when you have a net positive flow to the place where you would like to extract some work or useful energy. To drive any form of heat engine of thermal radiation you also need a colder place against which the heat engine could do its work (Carnot Cycle, look it up). C) Using IR photons for photo-voltaic processes won’t work either. The per photon energy is not sufficient to derive a useful voltage from semiconductors for energy purposes. Plus as the upwards going radiation is larger than the DLR you could simply soak that upwards gong radiation up if you had any technology to convert IR photon energy into electric energy. D) Now lets go to the day case: The average insolation is 230W/m2 (that is a day and night average). It is obviously significantly larger than the NET outgoing IR of about 60W/m2. So whats up with that difference of about 170W/m2? Well it resembles energy removed otherwise. Evaporation is a major component, convection via updrafts and winds another. Plant growth a small matter (literally). It might be an interesting exercise to work out where all that remaining 170W/m2 goes. E) Energy use during the day: During the day time the insolation could be as high as 800W/m2 or sometimes close to 1000W/m2. That means you can use this to significantly heat surfaces (Hot water solar for example) or use the high energy photons in the visible and UV spectrum of the Sun for PV solar panels. Not that odd, that’s the units of the Australian study – a “per day” average in Megajoules. I just converted to common terms of W.m2 per day to compare with Darwin DLR from SoD. OK, the implication being that they can have energy collectors facing down during daytime to capture this prodigious 465W/m2 of energy along with solar from upwards facing collectors and upwards facing collectors for collecting night-time DLR. Net is calculated AFTER measurement of downward and upward fluxes. Wrong as above. In addition, the reason LWIR (upwelling or downwelling) is NOT utilized as an energy source as solar is, is that you (and many others) are attributing equivalent heating effect to DLR (IR-C) as is normally obtained from IR (and some UV) in the solar spectrum (IR-A/B). Using the terms of an electrical analogy (a very loose one), it is the difference between “real” and “apparent” power. Yes you can measure DLR or ULR in the same units as DSR but the capacity to do work is vastly different. That was the subject of a post here at CCG a while back. Again. 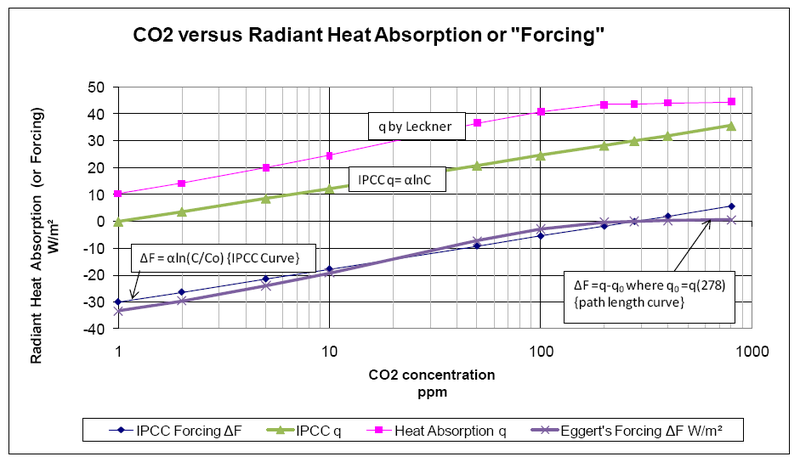 a REAL heating effect (you’re talking cloudless solar peak there BTW – the effective figure is somewhat less) not available from the daytime 465W/m2 ULR or average 409W/m2 Darwin DLR that is erroneously attributed by AGW to being an effective heating agent i.e. 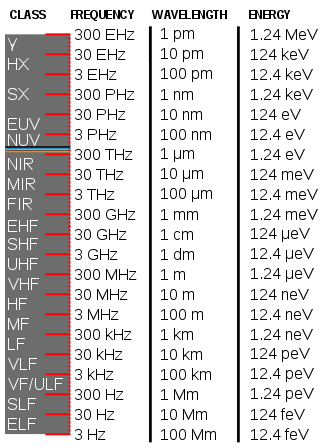 “the high energy photons” are in the solar spectrum, the LWIR-C photons are relatively much lower energy (see the EM spectrum table). Just because you can measure something doesn’t mean it has real effects Thomas. LWIR/DLR/IR-C is NOT in the solar spectrum. Energy-per-photon in IR-C is considerably lower than IR-A/B in the solar spectrum. Ergo, PV DOES work in the solar SW spectrum including IR-A/B but NOT in the LWIR IR-C spectrum. Again, I think you don’t see the trees for the forest Richard: What is the current value for CO2 forcing? This graph shows the components making up the anthropogenic forcing. Overall it is about 1.6 W/m2 at the moment. Darwin has a DLR average annual of around 400W/m2 and the signal is noisy. You can not expect to see the 1.6W/m2 of CO2 forcing directly in observational data in Darwin amongst the noisy 400W/m2 measurements. But if you wonder what 1.6W/m2 forcing does to the planet generally and especially at the poles where the effect is most pronounced, look no further than the temp anomaly measurements of earth and especially their geographical distribution. But UV-A penetrates deeper than UV-B over a much wider angle of incidence. That’s an example of radiation/material “tuning”. Laser and microwave intensity is another, often there’s a necessity to turn down intensity to get penetration, whether gases containing particles…..or chickens, respectively. But you should be able to identify it over the long term because that is supposedly the “1.6W/m2 of CO2 forcing”. I’ve cited 5 long-term studies of DLR: Gero and Turner (Great Plains), Francis and Hunter (Alaska), Can’t recall authors (Antarctica), Wild et al (GEWEX), Wu(?) et al (SURFRAD). None of which exhibit anything commensurate with aGHG forcing in sign or magnitude. You on the other hand have come up with nothing, just hand waving. And of course you can’t see 1.6 W/m2 of CO2 forcing in amongst 400+ W/m2 noisy data, it is totally insignificant – even if it does exist. But unless you can produce the observational evidence as above (and you haven’t so far), you have no basis for proof of causality (and there are other explanations for Arctic anyway e.g. AMO/NAO). Francis and Hunter is a DLR study from the north polar region and there’s another from the south, neither provide that evidence “especially at the poles”. Those are values of components of a posited methodology (IPCC’s RF from 1750). Is does not necessarily follow that the methodology is valid or the effects are real and measurable. For going on 2 decades now, in the absence of the posited 2 C/decade aGHG temperature forcing (i.e. we should have seen 0.4 C rise over 20 yrs but we haven’t), it is looking increasingly like the methodology is fallacious. Thomas, the IPCC’s CO2-centric solar-specialist go-to guy Mike Lockwood has pointed out that estimates of solar output variation between Maunder Grand Minimum and Modern Grand Maximum range to 6 W.m2. I know of 2 such papers specifically finding 5.75/6 W.m2 and I think I might know another if pressed. So I don’t “wonder what 1.6W/m2 forcing does to the planet generally”, I wonder about a 400 yr solar variation closer to 6 W.m2 and what effect that has at the surface (think sea freezing across the Bosporus thick enough to walk on in the MM). The IPCC discounts the larger solar estimates because it ruins their narrative. Also, they left solar forcing at Modern Grand Maximum levels out to 2100 in CMIP5/AR4 simulations. That has since proven to be a gross error. Yes they spoke of Mega Joules, a unit of energy. If you divide this by time as in “per day” it becomes a measure of Power expressed in Watts. If you divide this by m2 you get a power per area or Energy flow per area, also expressed as Watts per m2. If you divide this once more by time as in: Watts per m2 per Day you get nonsense…..
Net is all that counts for thermal collectors. If the outgoing radiation is greater or equal the incoming – and remember unless your collector is colder than its surroundings that will be the case for thermal collectors – then you have nothing to collect. You are loosing energy…! The only way Richard that you can extract energy from the temperature difference between two surfaces is if a) there is a difference and you actually have a net flow of Energy, and b) if that temperature difference you are exploiting is large enough to get a meaningful efficiency from a process extracting work. Of cause the flow of thermal energy must be towards your system of extraction, not away from it. Again, I recommend looking up “Carnot Cycle”. Its quite interesting. However researchers are extending the frequency range useful to PV cells all the time, also to the near IR frequencies and last year new materials, some based on carbon nanotubes, made significant progress. However extracting energy in quantities useful for a nations energy systems as you suggested from Thermal radiation at room temp levels is not on the drawing boards. The efficiency in Watt/m2 would be utterly dismal. And the supposed planetary imbalance is only 0.6W/m2 (Hansen) so it’s down to less than 0.2% of the total. Rubbish. You get an averaged per day comparison basis. The Australian study is on a PER DAY basis. SoD’s mean is on a PER DAY basis. Once you get the units in common terms W (J/s), the Australian study data can be directly compared to SoD’s. That is how the fluxes are MEASURED Thomas. In other words an instrument detects an energy flow. Your “perpetual motion” criticism is EXACTLY the criticism being levelled by AGW sceptics (and those saying DLR has negligible heating effect) at Kiehl and Trenberth 09 and updates – and AGW. Thank you for joining the sceptics on this Thomas. It is a balmy notion that 324 W.m2 – DLR (“Back Radiation”) or 390 W.m2 – ULR (“Surface Radiation”) is energy available for useful work but AGW assumes it is available. But first the “energy” has to useful energy. Energy in the solar spectrum can do work. Energy in the LWIR/IR-C/AGW “backradiation” spectrum cannot do work beyond negligible. Bulk ocean heating being an example: solar SW is the bulk ocean heating agent, DLR does little beyond aid evaporation, if that. Thank you Thomas – that is EXACTLY my point. And what is the energy-per-photon difference between solar IR-A/B and DLR (IR-C)? 1.24/0.124 = 10 times compared to your “1/20th” at “say 500nm” (20 times). Sorry RC, your confusion is getting worse. One one point you suggest using DLR or IR upwelling radiation (ULR) for energy generation and the next moment you assert that it has no difference on the heat content and temperature of the oceans and the rest of the planet. Neither DLR nor ULR are useful for work extraction in order to make electricity or so on. You would need a considerably colder side to the equation to begin extracting work from either. Ever meditated over why thermal power plants need cooling water or massive cooling towers…..
Having said that, DLR of cause is a significant component of moderating our climate to the temperatures we see. Without it Earth would have a surface temp a lot lower than today at around -18C and without it, Venus (if you leave the high albedo of the atmosphere due to sulfur compounds but remove the IR properties of CO2) would sport much cooler temperatures at the surface of -34 Degrees! Check it out. On photon energies: The peak of the solar radiation is around 500nm, the peak of our ULR around 10,000 nm. The energy of a photon at 500nm is about 20x that of an average ULR one. Now this argument (photon energies) is significant if you want to make any sort of PV arrangement using IR photons. It means nothing if all you are interested in is looking at the thermal flux where simple thermal absorption is all that counts. The every DLR photon that is not outright reflected back from the surface delivers its energy to the surface where its absorbed. In Darwin that’s around 400W/m2 as we know. We also know that Darwin will emit some 460W/m2 on average from the ground. Net 60W/m2 upwelling or cooling of the surface. Any increase in DLR will result in a likewise reduction of the net ULR and hence cooling, resulting in a warmer surface. The 1.6W/m2 CO2 forcing is global. Water vapor feedback is adding significantly to that, especially in the wetter climates. And your hope to see an increase in observed DLR at Darwin and around the globe visibly in the data would require us to have baseline measurements of the same from well back in time, which unfortunately we don’t. Yet the result of all this is the well known build up of heat in the earth’s climate system, and that is too much to ignore. (for most of us anyway). RC, I am getting tired of this. When I teach Physics I normally get paid…. and you are a student with a lot of basics to cover and in my humble opinion well over your head in the matter. But good luck to you and your mates. Do you ever read this stuff back to yourself? Have you really not learnt a thing yet? The atmosphere isn’t warming, dude. There is no tropical hot spot, which is a necessary condition of water vapour feedback. Good grief, and they call us deniers! It’s your confusion Thomas – not mine. Yes, I’m highlighting the absurdity of the AGW assumption that DLR is on a par with solar for such an application. That’s a lie Thomas, I made no such assertion. Again you out yourself as a closet AGW sceptic Thomas – glad you’ve finally seen sense. And now you contradict yourself Thomas. But significant? What is the observational evidence for this (citations please – no hand waving)? You have not come up with ANY papers so far – I’ve cited 5 on the other hand. In addition DLR does NOT equate to CO2 forcing, the observed signs and magnitudes are not commensurate. And the energy of a photon at 1000nm is about 10x that of an average DLR one i.e. solar does the business, DLR does not. Specious argument. There’s net downwelling/upwelling radiation when solar is included but that doesn’t stop solar collectors being installed to intercept (harness) the downwelling component that does useful work. What tosh. ULR is NOT “net”. Rnl is nett in the conventional heat loss equation (look it up). Actually we do Thomas (BSRN, SURFRAD). And there are scientific papers studying both networks along with site-specific studies (e.g. Great Plains, Barrow, Antarctica). A build up that is at standstill in the atmosphere (as acknowledged by Hansen, Sato and Ruedy, NASA GISS). And also at standstill in the upper ocean (Pacific and Atlantic actually cooling). You’re certainly NOT teaching me physics Thomas (If you did I would fail by the standards of my education). I know more than the “basics” including academically (that was 30 – 40 odd years ago and I’ve been learning ever since). Now you are resorting to put-down since you’ve painted yourself into an embarrassing corner. And the arctic melting, like sea ice volume going down or sea ice extend shrinking, na all just an illusion really. Nasa, NOAA and PSC don’t have a clue anyway, just scientists who rarely know anything anyway. They should ask Bob, he knows. All indications of any of the graphs above that might suggest to the untrained eye a warming trend or an accumulation of heat in the oceans is completely illusory. Just tilt your monitor downwards on the right and she’ll be ok…. Oh, for the sea ice graphs you must tilt it to the left. And I am sorry that people have been calling you a Denier…. It is so obvious that earth is not warming. In fact one could imagine it might be cooling really. If the upper Pacific and Atlantic Oceans have been cooling since 2003, there’s no anthropogenic ocean heating going on – period! TONY JONES [ABC Lateline to Bill McKibben]: Let’s start with the statement most frequently used by climate change sceptics: the planet has stopped warming since 1998 and started to cool, actually cool, since 2003. True or false? But how long before the cooling is significant? “The planet has stopped warming since 1998 and started to cool, actually cool, since 2003.” True or false? I am David and so is my wife. I’m humbled (and amused) that my existence has cause so much discussion on this site when all I did was poke my nose in, wind you guys up and bugger off. I had no intention of coming back because from what I can see none of you says anything I can’t find in a hundred other denier blogs and few (if any of you) know more about climate change than I do – which is 5/8 of 3/4 of bugger all. Love your work guys, I’ll definitely be back now that I’m an icon here. Feel free to talk amongst yourselves about me while I’m gone. Icon? Oh, hardly. You contributed the confusion of an identical screen name. Who will that make famous? What a jolly sense of humour you have, David, to be sure. Most amusing. Sense of humour? Nah, I just don’t take either you guys or myself seriously, especially when it comes to climate change. None of us know enough about even one area to warrant being taken seriously so why would anyone in their right mind listen to us, let alone base decisions on what we say. Like the wise man said, “always look on the bright side of life”.